Last year saw a lot of leading retailers such as House of Fraser and Bentalls install beacon-enabled mannequins in their store. These mannequins detect when a user is closeby (in-store or looking at a window display) and provides them with information about the various brands adorning it, related offers as well as its location within the store. What makes it difficult, however, is that these smart mannequins require not the retailer’s but the mannequin’s companion app to be installed. That’s an additional app install for a retailer to worry about. However, it is also possible to easily implement this with your store’s existing mannequins using your brand’s app. 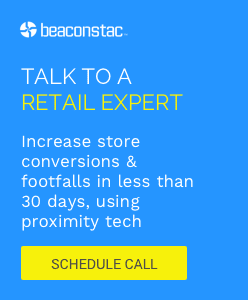 Let’s take a look at how you can run the same campaign with Beaconstac, a proximity marketing software platform. The campaign requires the mannequins to send out a message about the clothes and accessories on it after a customer spends more than 10 seconds near it. It’s possible to set this campaign up in various ways. For the sake of simplicity, let us send information about only one of the mannequins as shown in the image below. The first thing to do is purchase a beacon and add its major and minor number in the dashboard. Since this is a test campaign and we’re using just one beacon, I’m adding these details myself. If you’re using more than one beacon, it is possible to import the beacon IDs into the dashboard automatically. Once done, you need to create a simple rule about when this beacon needs to trigger an action. 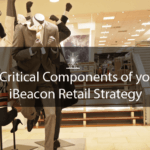 We are going to set this as “on Entry” after 10 seconds, which means that if a customer spends more than 10 seconds near the beacon, the below mentioned action will be triggered. Next, we’ll create a card that the user will see on his/her device. Cards are basically creatives that show up as notification on the user’s mobile phone. Beaconstac offers several types of cards such as Summary, Photo, Media, etc. (We’ll get into the possibilities that it opens up in a subsequent post.) I’ll choose Summary cards for this campaign since it gives me the option of adding some text to describe the item. After this, we’ll add the action to be triggered when the rule is true. In our case, this involves sending the details of the Off Shoulder Top, Denim Shorts and Skinny Jeans in the form of a photo card. And voila! We’re done. You can now make the campaign live and see it in action. This is just one of the many campaigns possible with Beaconstac. You can also send a welcome message, provide time-limited location-based offers, use a customer’s purchasing history from your CRM to send relevant information to them. Do let me know your thoughts on the campaign described above. If there a specific campaign you would like to read about, I’ll be more than happy to share how you can get it done using Beaconstac.